I love to teach yoga to newbies. There’s an almost palpable sense of coming alive in those first few classes. As students learn to move in new ways, it’s not unlike a toddler explore her range of motion- testing out a foot here, or the gaze here, or marveling at what her body can do and how it feels to be in different shapes. Finally, when savasana comes and a group full of workaholic adults lies down to rest and breathe together, I love to watch as their faces soften and their bodies relax into their mats. I think most teachers would agree: it’s pretty magical to watch and work with the someone waking up through the practice of yoga. There’s also quite a visual distinction between the novice and the experienced student, of course. As a new student moves into a standing pose, you might observe a sort of “floppy” quality to his arms and legs. He’s watching the teacher, following the verbal instructions, and simply moving himself into what seems like it might be the correct position. You might observe that the hands and feet seem disconnected, even lifeless; an afterthought, or a forgotten accessory. A more senior student, on the other hand, is keenly aware of the sensations in her fingers and toes; the lines of energy lifting and expanding from uddiyana and mula bandha; the subtle changes in the breath and the micro-shifts of flesh, bone and breath within the external shape. So we see, then, that there’s a distinct difference between simply bringing one’s body into a shape, and bringing the feeling of the shape into the body. The beginner student moves (or, in many cases, forces) the body-pieces into an approximate puzzle-shape and then stands lifelessly in place. 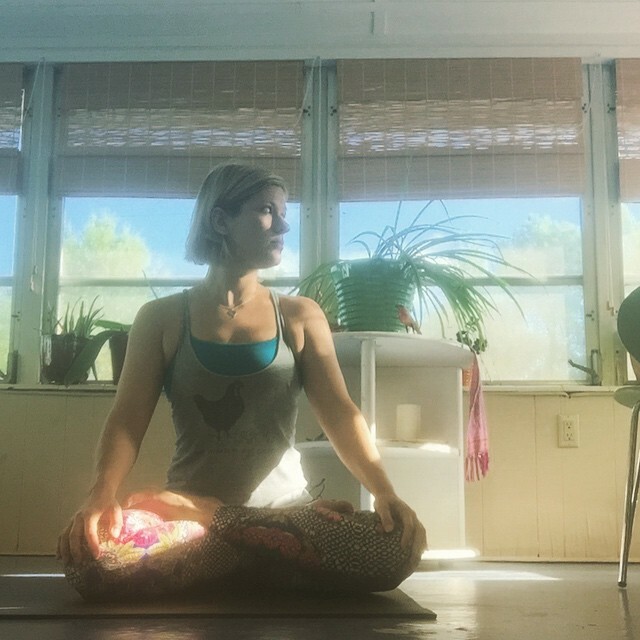 The senior student moves her body into her variation on the asana and then begins to occupy it actively, breathing and moving within the pose in a way that feels completely embodied and alive- full of presence. Presence is not some exotic state that we need to search for or manufacture. In the simplest terms, it is the felt sense of wakefulness, openness, and tenderness that arises when we are fully here and now with our experience. I remember very well what it felt like to “wake up” through this process- suddenly I was in my body, and breathing with it, and truly, there is such a sweetness and tenderness to being completely with yourself, aware, awake, alive. It was quite poignant and almost, in a way, heartbreaking, when I realized how I’d neglected myself in this way. As is so often the case, the on-the-mat experience provides a fantastic metaphor for our lives off the mat. Recently, I’ve been examining my relationships with others- current and historical- in light of this quality of presence. I believe that it is not enough to simply move ourselves into position with another person- that is, to say, I’m your lover, I’m your friend- and then occupy that space lifelessly. True love- romantic or otherwise- is only, I think, alive and breathing when it is infused with this wakefulness, openness, tenderness. Maybe it’s inevitable that this will happen with certain relationships, at certain times in our lives. Perhaps we are so occupied with our own challenges that we can’t embody love in this way. Maybe we’ve never learned how. In my own case, I can see quite easily that while I might have called myself a wife, or a girlfriend, and truly felt that I was living in that role, there was an inauthenticity, an incompleteness, to my actions. At the time, I didn’t know how to fully be present with that person- to love him fully, actively- because I was so unhappy with myself. It’s also clear that we were poorly matched, in many ways- so that to be fully present would have meant to acknowledge a painful truth. In another case, I can recall asking myself why I felt so terribly lonely when I was with someone who said that he loved me deeply. I knew that it was true- and yet I believe at the time he simply wasn’t capable of completely embodying love. He was in the pose, so to speak, but the presence, the attention, the wakeful, open and tender quality was not there- and so our relationship could not flourish. As part of the spiritual path, bringing mindful presence to our relationships is far more challenging than the work we do on our mats, at least in my experience. While I can do hours of asana practice or meditation with some degree of awareness and presence, I’m challenged deeply by the daily work of embodied love. My concern with my own self-image, my need to protect myself in some way, often stands between me and full presence with others in my life. Like most people I know, I’m struggling to somehow look good and feel in control. There’s a vulnerability in setting that aside in service of this quality of presence. With practice, this grows easier, I’m finding, and the feeling of really, really giving your full loving attention to someone is its own reward. Some yoga students never make it past their first class. It’s not easy to work with ourselves in different ways. Sometimes the pain of waking up may feel like too much. And yet- that tenderness, that feeling of being fully present- oh, that’s worth it. We deserve our own kind attention in this way, and we find that because we are kind to ourselves, we’re more able to give that same kind attention to others. And, waking up, we become open and receptive to embodied, active presence from those who are also learning to love fully and completely. This entry was posted in Buddhism, Off-The-Mat, Uncategorized and tagged embodied presence on November 24, 2015 by laurasana. Who the heck do I think I am, anyway? This thought woke me, and I opened my eyes in the dark to look toward the ceiling. I felt myself breathing and absorbed this thought. This wasn’t a new concept to me- my teacher, Yongey Mingyur Rinpoche, and many other Buddhist writers speak of this frequently. But I felt I wanted to share this with you, to try to explain how it’s unfolding for me. In my experience, it has taken some time, coupled with meditation and contemplation to begin to have a felt sense for how this might be true. After all, isn’t there some continuity to our experience? Aren’t I the same person I was when I was a baby, a child, a teen? Upon examination, the facts don’t really support this assertion: cells in our bodies die and are replaced. Studies show that through meditation we can alter the structure and function of our brain. And I certainly don’t look the way I did 10, 20, or 30 years ago. We can accept that some things will change. In another part of the same passage listed above, Dzongsar Khyentse Rinpoche notes,”of course, we say that some things change. A bud blooms into a flower, and we still think of it as a truly existing flower as it changes. That growth and change is part of our fixed idea about the nature of the flower. We would be much more surprised if it became permanent.” Still, I think, it feels more comfortable and familiar to feel that we are essentially the same person, with a quality of identity, self, or me-ness that we reinforce through habits and labels. Returning gently to this inquiry again and again- who am I?- or, even better, letting go of the “I” and asking, “‘Who is it that is experiencing this/breathing/eating this piece of chocolate cake*”- I began to feel that I could loosen up and relax into the ambiguity of moment-to-moment experience. What does it feel like to ‘relax’ with this quality? Like most humans I know, there are things I’ve said and done that have caused others and myself great pain or even harm. You know: moments that used to make me cringe; things I’d tucked away into dark corners of my memory as too painful to recall. The time I threw a plate at my ex-boyfriend. The hurtful, mean things I said to a friend. The way I ran out on friendships or relationships rather than dealing honestly with the challenges. If I experience myself as a fluid, changing, “transitional being,” I am able review these past actions with a quality of genuine kindness and understanding while still feeling remorse. Because I can now look honestly and critically at these events, I’m able to resolve to handle myself differently in the future. Yet habits are strong, and the more we repeat them, the stronger they grow (remember this blog entry?). So, in many cases, I’ve found myself repeating many of the same “mistakes.” I forget that I am fluid, in-process. Sometimes I even feel trapped, as though I have to do something simply because I’ve done it so frequently before! That’s it, guys- the opportunity to experience yourself differently is always available. You’re not the same person you were yesterday. You’ll be different tomorrow. The orchestra seems like a continuous, solid entity- and for convenience, we refer to it that way- but it’s constantly changing, and so are you. So is your partner, your best friend, the guy in front of you at the grocery store who’s maybe a little bit smelly or rude or whatever offends us. Again, I am speaking here to my experience- for me, one of the dangerous things about the earliest steps on the spiritual path has been my tendency to feel like “I’ve got it!” So, in reading a piece like this, for example, someone may be feeling like, “Yeah yeah, I’ve got this, I’m changing, I’ve changed, I quit smoking, I do yoga, things are great now! High-five, soul sister!” One of my meditation instructors- a compassionate, kind, brilliant man- frequently says, “Every insight is a false summit.” I return to this again and again. Every time I think I know something- every time I think I understand a concept or really “get” impermanence, for example, I find that I really don’t know anything at all. It’s humbling: the more I learn, the less I know. So right now in my life, I’m asking myself, again and again, Who Am I? Who Is This?- and hoping that maybe I’m continuing to loosen up. Flow on, fluid friends. You’re not trapped. You’re not stuck. You’re in process. And that’s really good news. *This is Pema Chodron’s idea- in fact, I believe she says she might ask herself, “Who is eating this third piece of chocolate cake?” More reasons to love her! This entry was posted in Buddhism, Depression, Impermanence, Meditation, Uncategorized and tagged impermanence, transitional beings, you're not stuck on June 18, 2015 by laurasana. In last week’s post, I talked about the self-sustaining karmic energy of recurring habitual patterns. I mentioned that meditation has been helpful in creating the space to identify the pattern and then to create a new pattern. How exactly, though, does the new pattern get created? In the past year, I was lucky* enough to find myself facing similar situations again and again. In fact, sometimes it was really almost the identically same situation, with the identically same person. Thanks to my meditation practice, I was able to see this happening (okay, after a while. Not so much right away) and I gained some time between stimulus and response. Then I’d ask myself: 1) How did I handle this last time? 2) Was I happy with that outcome? and 3) If not, what had I not yet tried that might have a different, better outcome? This was a pretty painful process at times. It caused me to look back at the many previous times I’d been in the same situation, and how my actions had caused suffering to others, as well as to myself. There were days where I felt like a total scumbag and thought it might be best to stop interacting with other people. But seeing how I’d hurt others was powerful enough to enact change where the fear of simply hurting myself wasn’t enough. As I mentioned in last week’s post- I just had to try something different. 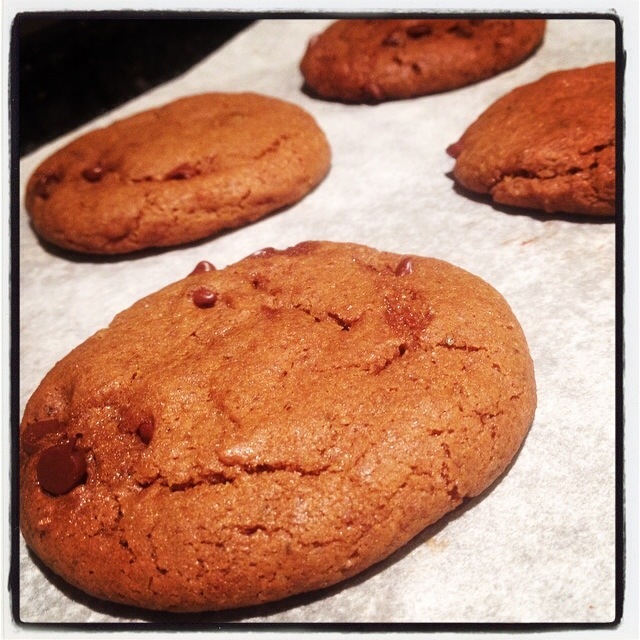 In the spirit of trying something totally different, I offer you this delicious recipe for vegan ginger chocolate chip cookies. If you’re a fan of soft molasses ginger cookies, and love a dark chocolate fix, I think you’ll enjoy this mash-up. This recipe started with this delicious recipe from Oh She Glows. Thanks, Angela! a sprinkle of cardamom, or get creative with any spices you like! Making It Happen: Preheat oven to 350 degrees. Combine coconut oil, sugar, molasses, vanilla, and chia seeds until well-mixed (I throw it in my Kitchen-Aid and let it run while I mix the dry stuff). Separately, mix the dry ingredients. Add the dry ingredients to the wet until combined, but don’t over-mix. Add chocolate chips. Wet hands lightly, and roll into small balls. Flatten lightly with your hand and bake 10-12 minutes or until done. Rest on baking sheet for a few minutes before moving to cooling rack. Enjoy! *Not being facetious. Until I was challenged in this way, I was likely to keep creating the same karma again and again. I was forced into growth! This entry was posted in Buddhism, Karma, Meditation, Off-The-Mat, Recipes, Uncategorized on September 2, 2014 by laurasana. A few months ago, I started reading The Mastery of Love by Don Miguel Ruiz, and it’s had a serious effect on the relationships in my life- including that most treacherous of relationships, the one with myself. Ruiz goes on to describe what it’s like if you forget that you have a magic kitchen. Suddenly, you’re starving, and the pizza deal sounds not so bad. And then you’re hooked on the pizza- and dependent on the pizza pimp. Your heart, of course, is the magical kitchen, and food is the love that we have for ourselves and others. Our ideas of self-worth, self-appreciation, are all cooked up in this kitchen. When we forget about the kitchen, then we try to look elsewhere for love, appreciation, validation. Sometimes we get pretty desperate and do some stupid stuff to try to feed the unending hunger. This metaphor was really powerful for me (because I love food? I dunno) and came at the perfect time in my life. I realized that, despite all the work I did, and continue to do, I’d forgotten that the power to feel loved, valuable and worthy was in my own hands– not in someone else’s. And yet, I kept forgetting it- I was looking for someone to feed me. If the thought of falling in love with yourself sounds overly dramatic or self-centered, perhaps the magic kitchen metaphor will appeal to you more. To me, it’s so silly that it’s sort of fun to work with. Sometimes I like to imagine myself turning around and saying, “Oh, there’s the kitchen!”- as though I’d forgotten about this room in my house for a while. It also lends itself to more elaborate metaphorical musings. For a while, I was really longing for a relationship. ‘Sure,’ I thought to myself. ‘I’ve got a magical kitchen, but all it makes is burritos. I’d just like a freaking panini once in a while.’ With time and distance, I came to feel that the panini wasn’t so great. Laura’s Magic Kitchen Brand Panini is way, way better. Here’s an inferior panini story: I dated someone not too long ago who expressed great appreciation for me in many ways. At first, it felt good- yay, pizza!- but occasionally the (still metaphorical, are you tired of it yet?) pizza supply would dry up a little bit. “You know,” he’d say, “If you want to lose weight, you should….” Or, “I even like this about you.” This hurt, of course, because I was depending on the pizza to fill my growling tummy. I saw the panini guy not too long ago (he’s no longer dealing, or at least I’m not buying, so to speak). He has also read The Mastery of Love, and we spent a little time talking about the Magic Kitchen. When we hugged goodbye, he said to me, “Thanks for letting me bask in the warmth of your Magic Kitchen for a while.” I loved this! I’m like a food truck, y’all, out driving around loving myself, loving you, just doing the best I can to remember that I’m behind the wheel, standing over the oven…(this metaphor is really getting out of hand, I think I’m about done with it). Okay, but one last little story to share. That picture at the top of this post- me doing a handstand? That’s from a photo shoot by the genius, talented Jennifer Sampson of Sampson Photography. And it almost didn’t happen because I forgot about the kitchen. I’d had that photo shoot scheduled for months, and when it finally arrived last week, I was feeling pretty lousy. I weighed more than I wanted to, my skin was utterly broken out, and I felt, in general, like a hideous beast. I know how stupid this is. I do, I promise. But I also imagined people looking at the finished photos and picking out flaws. Once again, I’d put the power of love and appreciation and worth in someone else’s hands, rather than in my own. There’s no problem at all with being beautiful or ugly, short or tall, thin or heavy…There’s no problem with being gorgeous. If you walk through a crowd of people and they tell you, ‘Oh, you are beautiful,’ you can say, ‘Thank you, I know,’ and keep going. It doesn’t make any difference to you. But it will make a difference to you if you don’t believe you are beautiful and someone tells you that. Then you are going to say, ‘Am I really?’ This opinion can impress you, and, of course, that makes you easy prey. I do believe I am beautiful, and that things like weight, skin, and hair will come and go. Sometimes it takes me an embarrassingly long time to remember that I believe these things, but it’s getting easier. Not everyone is going to think I’m beautiful. Not everyone is going to fall in love with me. And, with my new extended menu options of self-worth and appreciation, I really don’t need them to. Happy Valentine’s Day, everyone- may your kitchen be full of delicious options today. This entry was posted in self-love, Uncategorized and tagged don miguel ruiz, magic kitchen, mastery of love, self-love on February 14, 2014 by laurasana. Depression, for me, is a drag. It looks a bit like seeing the world through dirty glass. It feels a bit like walking through knee-deep water. It’s like Monday morning after a weekend spent doing chores. It’s like your car needs new brakes and your toilet won’t flush and you know something else is going to go wrong, but you’ve accepted with a bone-weary knowledge and keep trudging forward. It’s also a little bit like I’m the only person in the world. It’s a selfish thing that hurts the people I love, if I let it. It’s like I’m standing on a beach full of pebbles, and I’ve picked up one tiny pebble and am holding it in front of my eye and it’s enormous, and now I can’t see the others because I am confronted by this boulder. “How can people kill themselves?” a friend of mine asked recently. “How can they do that to everyone around them?” Well, in my experience, there’s a certain kind of self-centeredness that comes with serious depression. It’s an ugly side effect. The holidays were hard for me this year- after the sweeping life changes of 2013, the holidays by myself felt a bit like a dirty nightcap at the end of a wild party I didn’t want to attend. I felt more down than I had in a long time. Yoga and meditation have been a tremendous help to me in fortifying my defenses against this disease, though. Recently The Onion published this piece: New Antidepressant Makes Friends’ Problems Seem Worse. Although it’s a really funny idea, there’s a great truth to it. The antidepressant is compassion. The secret is love. I do what I can to remember this: When I am allowing depression to get the better of me, I am not able to give my best to the people in my life. Now, this doesn’t mean that I can just “snap out of it,” but it does help to give me direction- to remind me to do the best I can to take care of myself so that I can be more available to people who need me. Friends, family, students. It helps me to make better decisions. So I am reminded that I can help myself to walk through this time by doing the things that will help me- my practice on the mat. A walk in nature. Meditation, regularly. And if once in a while I need to take a nap at 3 in the afternoon because I just can’t face the world, then dammit, I’ma do just that. I’ve got work to do, serious loving compassionate work to do, and I’ll do what it takes to help myself get to a place where I can be more effective. Here’s a poem to share with you. It arrived via Garrison Keillor’s Writer’s Almanac in my Inbox on December 30, and I burst into tears when I saw the title. If you’ve ever been so far down that you thought you couldn’t keep going- if you thought nobody would care- I hope this speaks to you as it did to me. Don’t kill yourself. Don’t kill yourself. Don’t. Eat a donut, be a blown nut. if necessary, but don’t kill yourself. passed, or be glad they’ve guessed. yourself, and hundreds of other people die. shoot yourself, it cracks the bio-dome. about it, and am grateful you stay. Eat a donut. Rhyme opus with lotus. Rope is bogus, psychosis. Stay. Dare not to kill yourself. I won’t either. This entry was posted in Uncategorized on January 10, 2014 by laurasana.